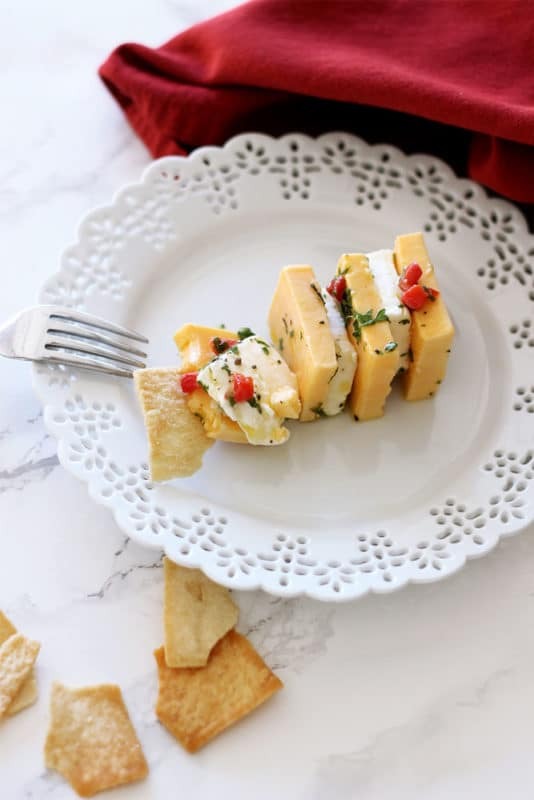 This Marinated Cheese recipe is the perfect appetizer! Marinated is the most decadent ingredients, this cheese soaks of the flavor the longer it marinates! 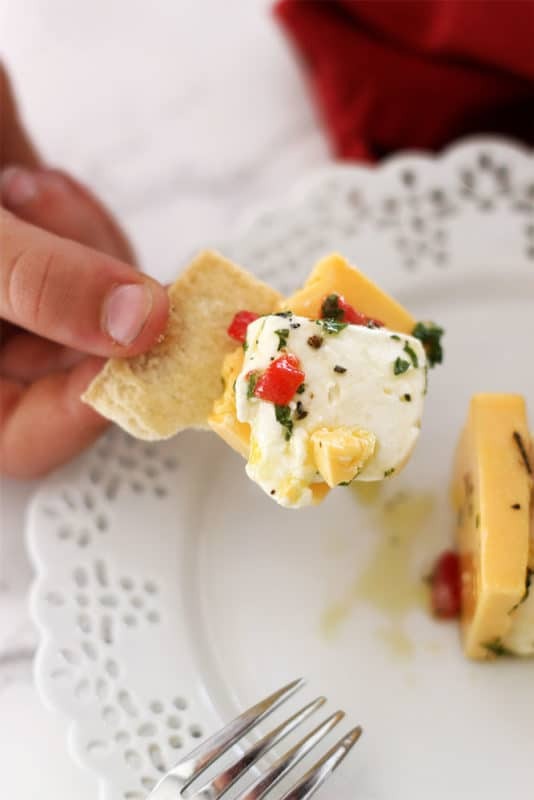 Serve with your favorite crackers or celery! Like most of you, we have get togethers with our friends and family at least once a month here at Mason Manor! And when it comes to hosting, you need good appetizers! 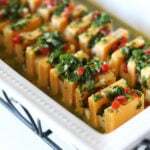 This recipe has to be one of my ALL time favorite appetizers! EVER! My mom introduced me to this recipe years ago. When she told me the ingredients, I wasn’t too overly excited but she told me to just wait and try a bite after it finished marinating. I’m used to marinating a variety of foods, but I’d never thought to marinate cheese! Man…was I missing out! Let me tell you, this Marinated Cheese appetizer is fantastic! And it’s SO easy to make! You literally slice and stack the two types of cheese, mix the marinade ingredients together, shake well and pour over the cheese. Cover with saran wrap and let it marinate in the refrigerator for 8 hours and then you’re ready to serve! I hardly ever eat cheese anymore but this one is so good so I splurge when I make this recipe. Or when my mom makes this recipe; yep I still enjoy when my momma makes me yummy food! Cheese has a lot of protein and good fats so I dive into this dish without hesitation. 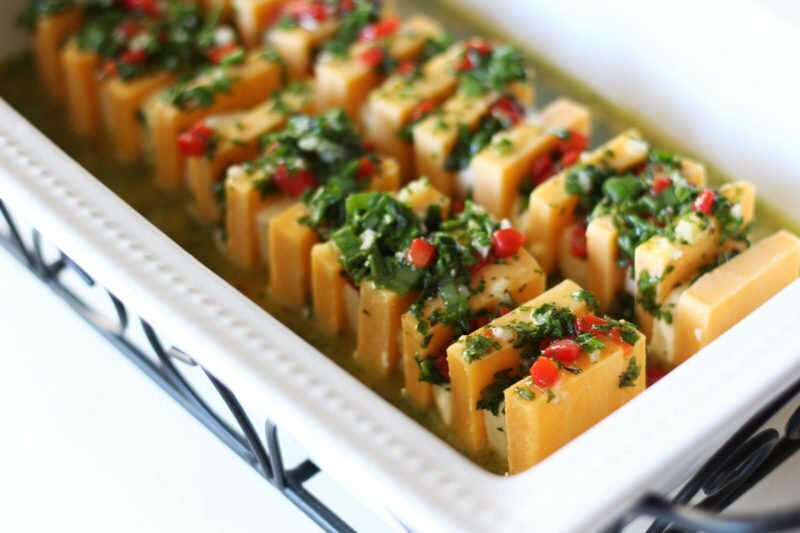 Plus, the marinade is olive oil based…I love olive oil and it’s so good for you!! Heart health!! This marinated cheese is really pretty too! Just look at it! It’s perfect this time of year for the holiday season. The red, green and white scream holiday colors – so people will flock to this appetizer! 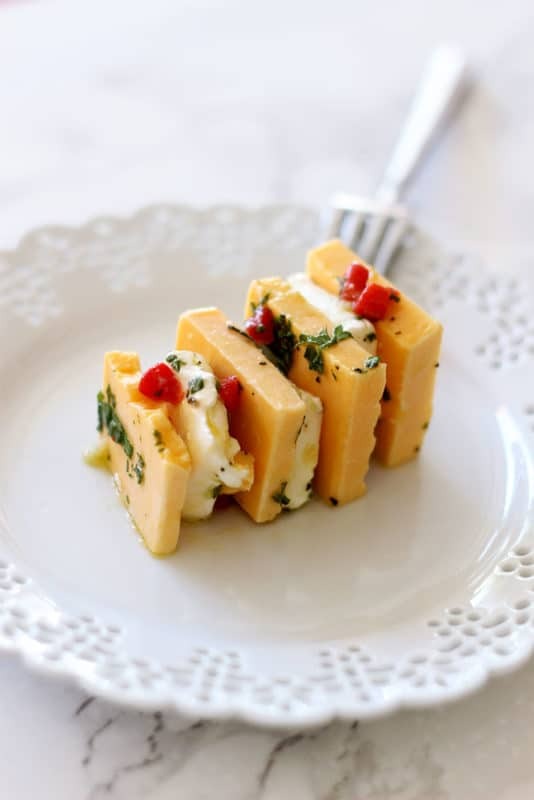 You can serve this Marinated Cheese with celery, crackers or french baguettes. When I ask people what I can bring to their house for gatherings, they always say, “Bring your marinated cheese! !” So this one is absolutely worth repeating! Did I mention that I cater here at Recipes Worth Repeating? When clients look at my website to put their menus together, I almost always get a request for this appetizer. People love this recipe and it gets rave reviews from my clients! If you’re looking for additional appetizer recipes, check out these other client favorites like my Garlic Mayo Chicken Baguettes with Gruyère, Bourbon Caramel Popcorn and my Basil Strawberry and Cream Cheese Appetizer! You guys are going to love this one! I’m excited for you to try it, especially since we are in the middle of the holiday season! Merry Christmas friends and enjoy! Combine first 9 ingredients in a jar, cover tightly, and share vigorously. Set aside. Cut cheddar cheese in half-length wise, then cut crosswise into 1/4 inch slices. Set aside. Repeat with cream cheese. 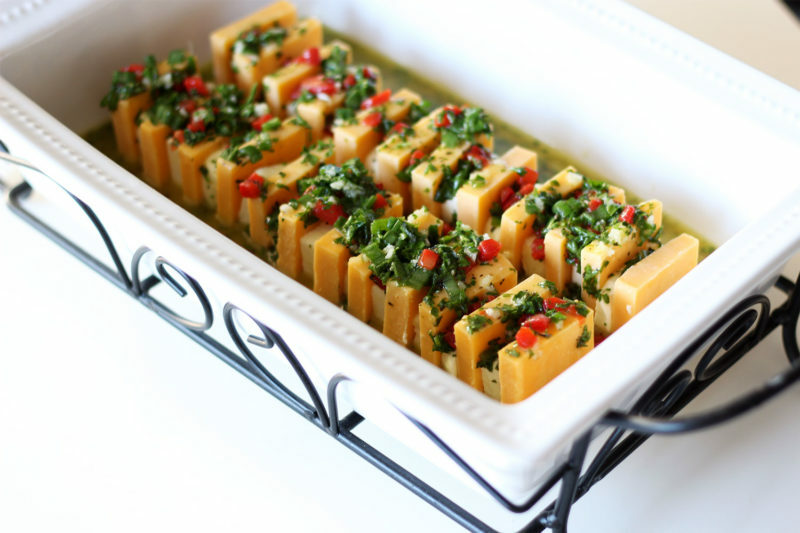 Arrange cheese slices alternating in a shallow baking dish, standing slices on edges. 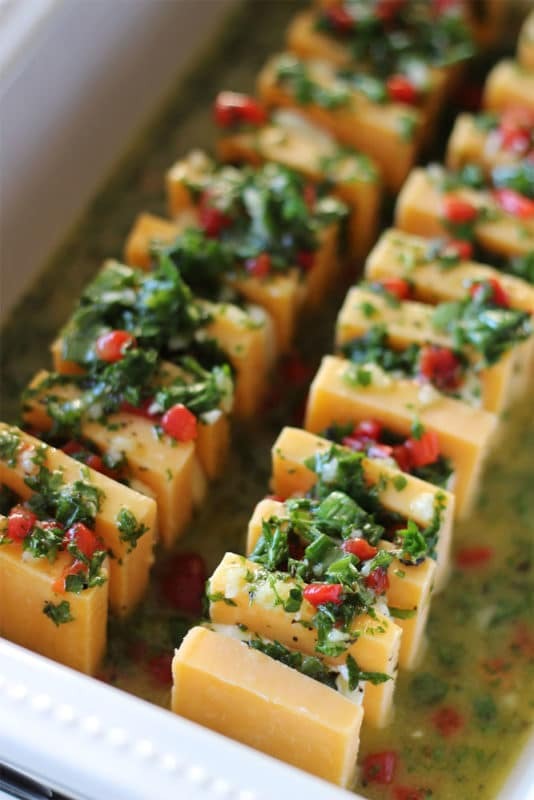 Pour marinade over cheese slices, cover and marinate in fridge at least 8 hours. Serve with your favorite crackers, celery or french baguette! 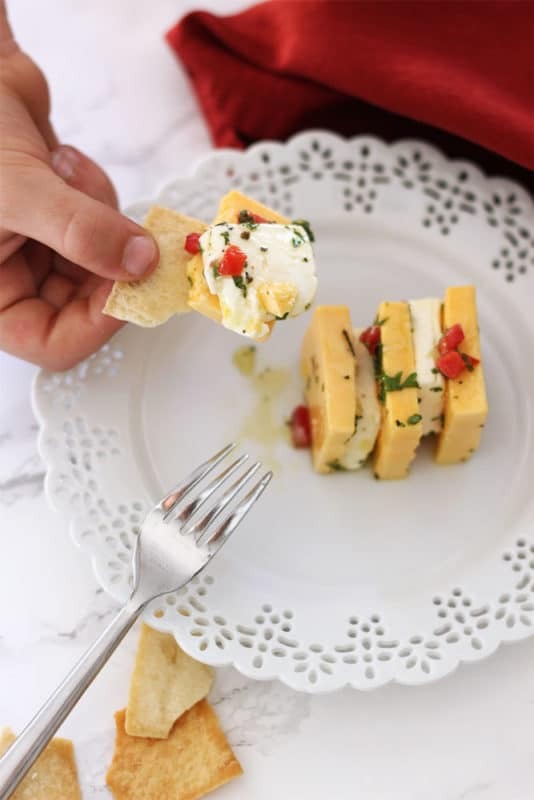 Pin this Marinated Cheese recipe to your favorite APPETIZER, SNACK and HOLIDAY board on PINTEREST! I have never even thought of marinating cheese before. It sounds so good! You’ll love it! It’s a classic! I’ve never thought to marinate cheese. Interesting! Will have to give this recipe a try. What a great idea! Such an easy and delicious appetizer. Yes! It’s so easy to make and all will enjoy! THIS! This is making it to my Holiday table. We are BIG cheese fans, and this looks like such a pretty (and delicious) addition to the table. I haven’t met one person who didn’t LOVE this dish!! It’s perfect for this time of year!